Above: Country singer Brad Paisley lounges Tuesday afternoon at Super Bowl Live on Nicollet Mall. Lori Salo had a choice to make: Bingo or country singer Brad Paisley? Just kidding. It was a no brainer for Salo as she manuevered her way to the front of a pack of fans, all trying to get a glimpse of the country singing star lying on a Sleep Number bed Tuesday in the old Macy's/Dayton's building on Nicollet Mall. 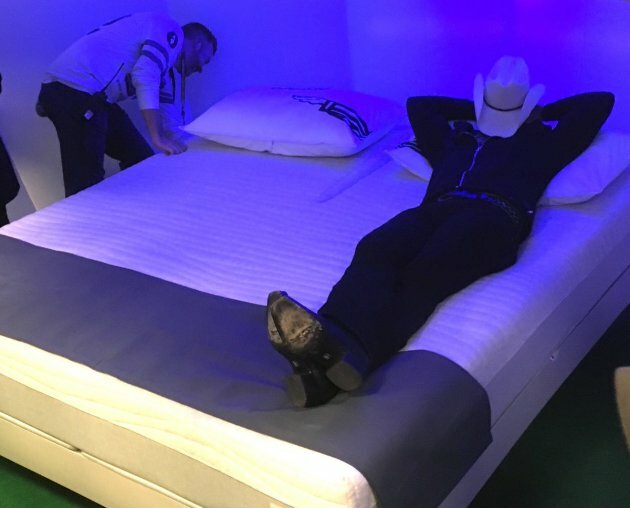 Paisley, was part of an afternoon pop-up event for Sleep Number at Super Bowl Live on the mall. "I'm interested in buying a bed, and he's about the size of my husband," Salo quipped. "I would just lie next to him. I wouldn't touch him. Nothing creepy like that." The stern-faced security guard wasn't amused. "I didn't think they would go for it," she said as she made her way out of the crowd after capturing photos and video of Paisley, who took off his cowboy hat but kept his boots on as he lounged back on the bed. Salo and other Paisley fans rushed to Nicollet Mall as word spread via Twitter and Facebook that he would be there at the Sleep Number exhibit. A few were lucky enough to get close enough to chat with the country singer before the 15-minute celebrity event was over. Alyssa Steves was one of those who made a "hard sprint" when she got word that Paisley would be on the mall. After getting her photos and video at the celebrity drop-in, she headed back to work. "I'm good to go."